Mazak Laser, Hyper Turbo-x HTX-510. 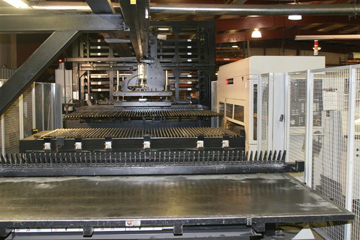 4000 Watt 5′ by 10′, with Mazak Type 3 FMS System. Includes 10 shelf raw material storage with load-unload and “Lights-Out” capacity. 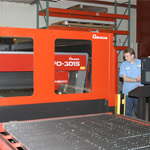 Amada Laser, Gemini 3015 4000W Flying Optic. Shuttle Table. 3/4 x 60 x 120. Amada Turret Press, Vipros 358 King. Four Auto-Index stations, 58 station turret. Amada Turret Press, Vipros 357. Two Auto-Index stations, 58 station turret. 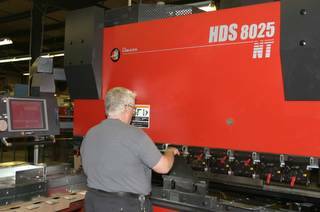 Amada Press Brake, Model HDS 8025. AMNC-PC control. 8′ x 88 ton. 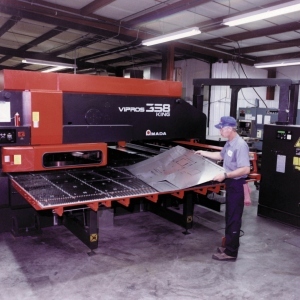 Amada Press Brake, Model 1303 HDS. AMNC – PC control, 8 axes of control, 127″ x 143 Ton. 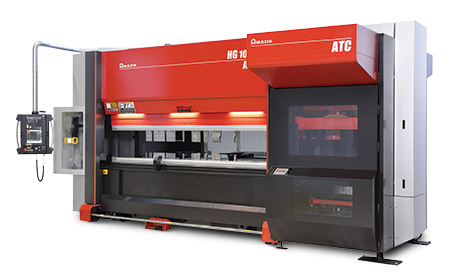 Amada Press Brake, Model RG-35. NC9EX Back Gage. 4′ X 35 Ton. Penn Engineering Pemserter(4), PS-4 and PS-4F. Insertion presses. Ursviken Shear, Type GSD5-4/30-150. 10′ X .156″.